give a photo collection session! WE ARE THRILLED YOU WANT TO GIVE A GIFT OF MEMORIES! 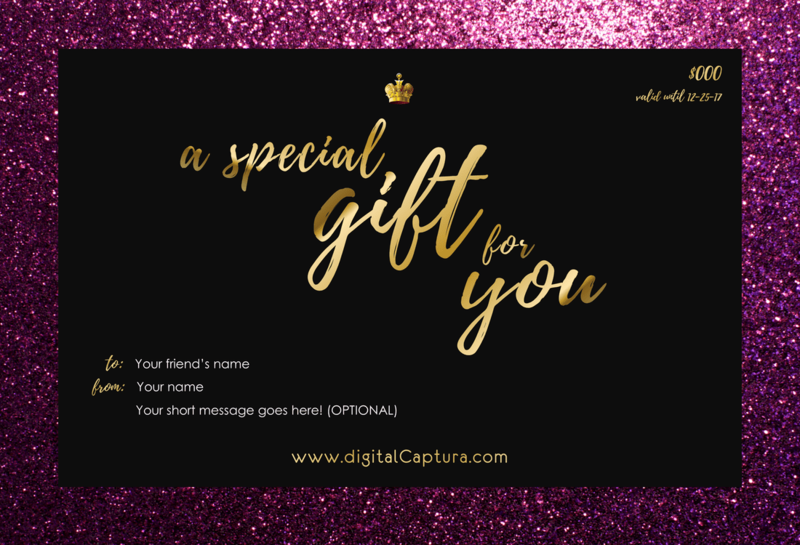 Whether it's a birthday surprise, a holiday gift, or a bundle for yourself, you can give "A Gift of Memories" for a partial or full photography session! Choose from $50 up to any gift amount you wish and wow your friends and family! We suggest you give between $50 - $700 for a collection session. 1. Once you have made a payment, you will receive an email confirmation from PayPal for your payment. 2. Personalize your gift certificate: After you make your payment via PayPal, click on the "Return to Merchant" button. You'll be taken back to digitalCaptura.com for one final step where you'll be able to personalize your gift certificate and choose a design. You're all set! Gift Certificate Processing: After we carefully personalize and design your gift certificate, we'll send it to you to your email within 2 business days. If you would like to know more about the kinds of collection sessions or investments your friends and family can choose from, please refer to the "Photography Menu". GIVE A GIFT OF MEMORIES! 1. Can I purchase more than 1 certificate? A: Yes, although they can only be purchased one certificate at a time. You may also purchase one certificate that can cover more than one session or service for your friends and family to redeem. ​2. 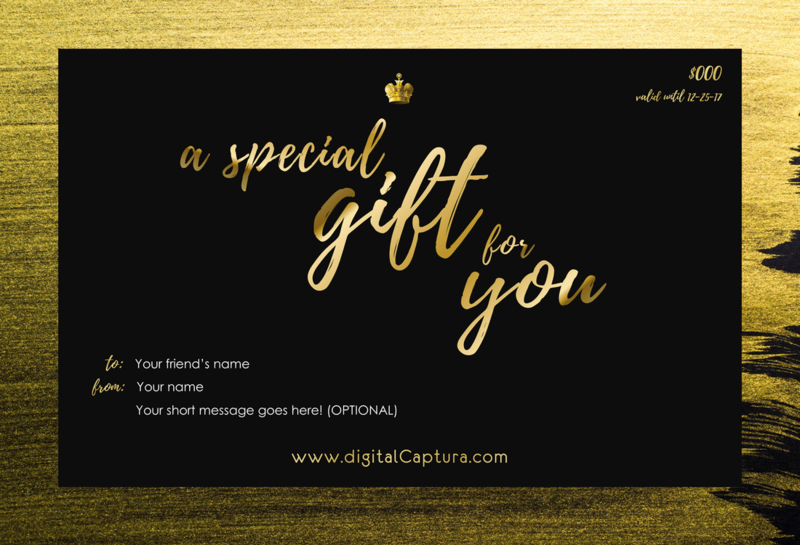 IS the Gift certificate Digital or physical? A: ​Digital. 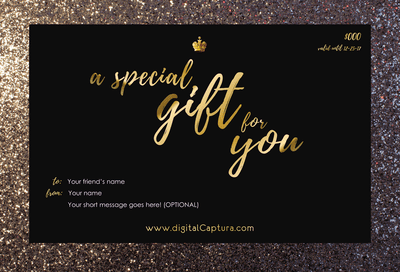 ​You will receive an email confirmation from PayPal for your payment, and a separate email from Digital Captura within 2 business days with your downloadable gift certificate. Gift certificates can be redeemed for any of our photography collection sessions! 3. What services can I or my friends and family pay for with the gift certificate? - Both the Deposit and Session. Gift certificates can be redeemed for any of our photography collection sessions! 4. Do I or my friends and family need to have a PayPal account to redeem the gift certificate? A: ​No, the gift certificate has already been paid for. 5. How can my friends and family reedem the gift certificate? A: ​They can reedem the gift certificate toward the deposit, or the session, or both (deposit and session), indicating their preference in the "Request Your Session" form. ​Your friends and family will need to present the gift certificate on the day of their session in order to reedem it. 6. HOW can I or my FRIENDS AND FAMILY book a session? A: ​Click "Photography" on the navigation menu and fill out the "Request Your Session" form. Or simply click HERE. ​If you already have a gift certificate and would like to redeem it, you can do so to pay your deposit, or your session, or both (deposit and session). Just indicate on the "Request Your Session" form that you have a gift certificate. 7. Can i personalize my gift certificate? A: ​Yes, after you make your payment via PayPal, click on the "Return to Merchant" button. 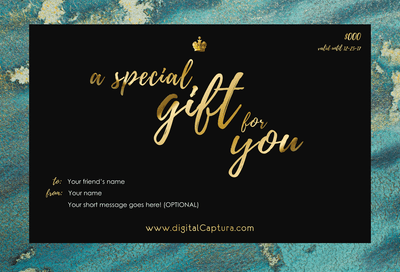 You'll be taken back to digitalCaptura.com for one final step where you'll be able to personalize your gift certificate and choose a design. Still have questions about purchasing a gift certificate? Please contact us, it is our pleasure to help you.